Talk about burning the midnight oil. 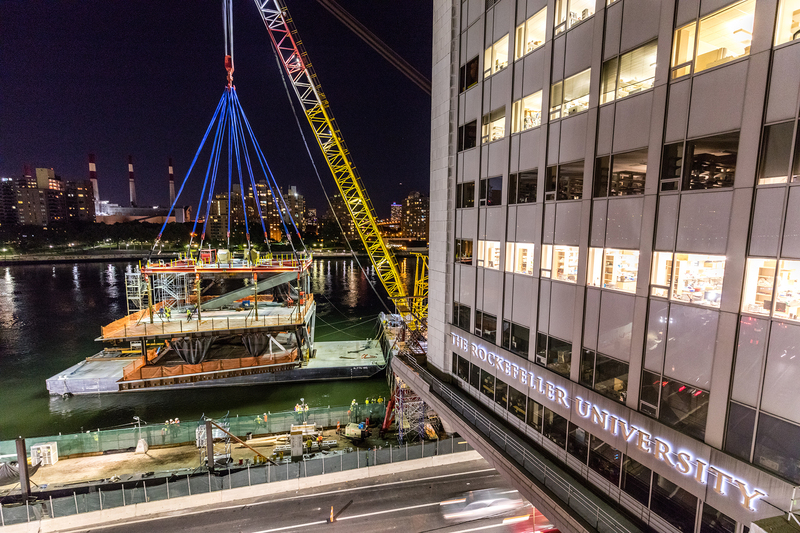 For 19 nights last summer, the project team for Rockefeller University’s East Side Manhattan campus worked well after hours to install 19 prefabricated modules — one each night — over New York City’s FDR Drive. Those modules were part of a two-acre expansion to the campus and formed a 165,000-square-foot, three-story structure that will hold a research lab and a conference center when it is complete. The project's precarious location challenged logistics, which drove the use of offsite construction, according to Curt Zegler, vice president and construction executive at Turner Construction, the general contractor on the project. Landlocked on three sides, the campus and the expansion site lack direct access to any kind of roadway, including the main road through campus. Meanwhile, the expressway that runs beneath the structure sees 175,000 vehicles per day and is flanked by the campus and the East River. Stopping traffic during the day wasn’t an option, and having trades work along a partially closed road posed safety risks. “It wasn’t too hard to put our thinking caps on and say we need to look at building this building at a remote site, to break it down into sections,” he said. Timing was critical to pulling off the overnight installations. The modules were fabricated 32 miles down-river in New Jersey, where they had to be ready to load onto barges in time to make it to the site for installation — a six hour journey. The team examined tide prediction charts to determine when the river’s current would be at its slowest. That turned out to be a two-to-three-hour window in the early morning hours for three-night stints. Those windows aligned with the three-and-a-half-hour block the New York city and state transportation departments gave the team to close the road. Their window: 1:30 a.m. to 4:30 a.m. Preparation was critical, and so the team planned out lift dates a year in advance. 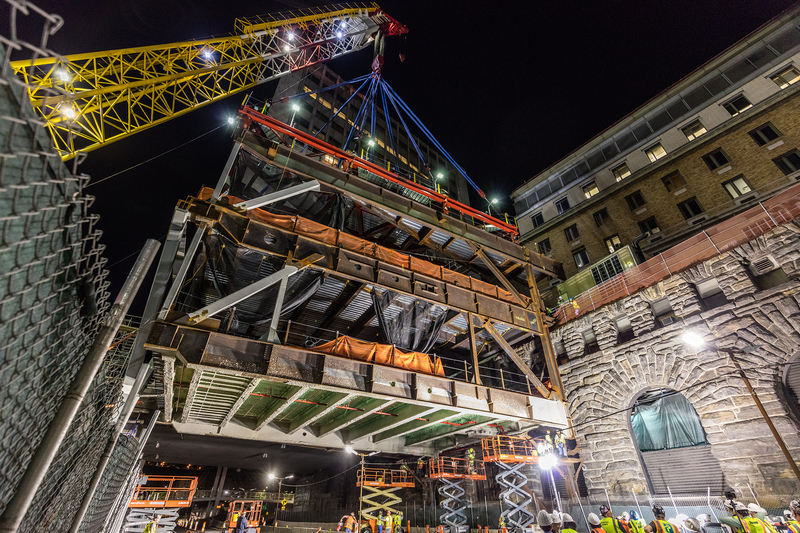 “The challenge there was making sure that everybody was laid out and knew their roles and assignments so that the structure was hanging in the air, ready to go when that last car passed so we could start rotating the crane," Zegler said. The team worked on-site from 1:30 a.m. to 4:30 a.m. for 19 nights. The process of rotating the crane, in this case, was a study in precision. Each component weighed between 350 tons and 790 tons and had a different center of gravity, so knowing how each module would behave on the barge and while being hoisted was important for installation to run smoothly. Turner worked with engineers from Thornton Tomasetti and erector NYC Constructors to center the gravity of each load, and with maritime engineer Donjon Marine to maintain buoyancy with the heavy pieces on the barge. Zegler said it took 60 to 90 minutes to rotate each module into position above the structure, at which point the steel erector began working on alignment. Attaching each module to the structure took 30 to 40 minutes. The rest of the time was spent bolting connections. “If anything was misaligned, we didn’t have a lot of time to fix it, so we had to have a lot of different options available,” he said. The structure may have been assembled in New York, but it was made in New Jersey. When looking for industrial space in which to build the modules, the team returned to a site in New Jersey along the Raritan River where large components for a similar project spanning the FDR — a unit of New York Presbyterian Hospital that used a pre-erected structural platform as its base — were made 25 years ago. “We erected the whole building in New Jersey, and then took it apart and shipped it up-river to New York City,” Zegler said. The team also used the New Jersey facility to do dry runs of the lifting process. Continual surveying and re-checking were critical to making sure the system they set up in New Jersey could be replicated in New York. Additionally, the project used progressive design-build, which meant the client was finalizing floor-plate layouts while the modules were being readied for fabrication. As a result, load transfers were continually in flux. Converting steel erectors to offsite was a challenge. Many weren’t hip to the idea of fabricating an assembly in a remote location, putting it on a barge, running it up the river and then dropping it over FDR Drive in the dead of night. “Insurance on the water is a lot different than on land,” Zegler said. NYCC, however, had a number of employees who were familiar with the process from working on the earlier FDR Drive project, which had also used the river for staging, Zegler said. Staying organized helped orient the project team around the efficiency goals of offsite. For example, the team applied lean construction principles like daily huddles and pull-planning sessions for the fabrication and assembly teams. The 19 modules were built in New Jersey and barged to the site. The structure was erected over the highway from June 2016 to August 2016. Currently, the project’s exterior wall is about 90% complete, interior MEP systems are finished, mechanical systems for the lab benches are underway and interior wall construction is in the works. The owners have an occupancy certificate for October 2018 — 14 months sooner than if the company had used conventional construction methods. Zegler added that the method shaved $20 million off the final bill, mainly from the reduced oversight and work hours required by offsite as compared to conventional construction methods. Zegler says it was the most collaborative project he’s worked on to-date.